Supported by Jefferson Lab staff volunteers, the BEAMS program introduces local fifth and sixth graders to real-world science and technical careers. With science, technology, engineering and math (STEM) fields outpacing the overall job market, Jefferson Lab is investing in early STEM education opportunities locally. 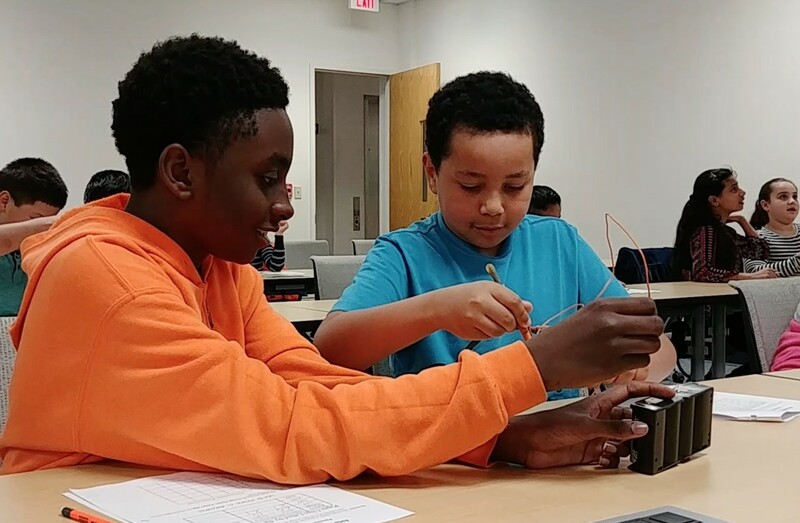 Established in 1991, the Becoming Enthusiastic About Math and Science, or BEAMS, program brings interactive, hands-on STEM activities to Newport News students and teachers. The longstanding enrichment program supports students from eleven of Newport News Public Schools’ Title I schools. Each school year, nearly 1,300 students and their classroom teachers participate in BEAMS. “We are proud of the impact that the BEAMS program makes in the Newport News community,” says Surles-Law. Joining the BEAMS program transcends a field trip experience. Jefferson Lab provides participating students a fun and enjoyable introduction to STEM education through positive experiences in the lab, while maintaining an SOL-based learning curriculum. Participating students take a glimpse into the research that Jefferson Lab completes by interacting directly with lab staff and completing interactive experiments. While the students are working together in small teams to complete experiments, their teachers are able to take a step back and observe them in a cooperative-learning environment outside of the classroom. A main goal of BEAMS is to involve students in STEM activities earlier in their academic careers in order to set them up for success well before entering college or choosing a technical career. By completing hands-on activities and participating in role model visits, students are able to engage in various aspects of STEM in a short amount of time. BEAMS participants get to explore different career paths by asking lab staff unscripted, off-the-cuff questions (just not age!) about their job, schooling, interests and hobbies. Students discover connections with scientists and engineers from favorite foods to a love for roller coasters and quickly realize how approachable a career in STEM can be. For instance, scientists at Jefferson Lab use electromagnets to steer the electron beam around the accelerator. 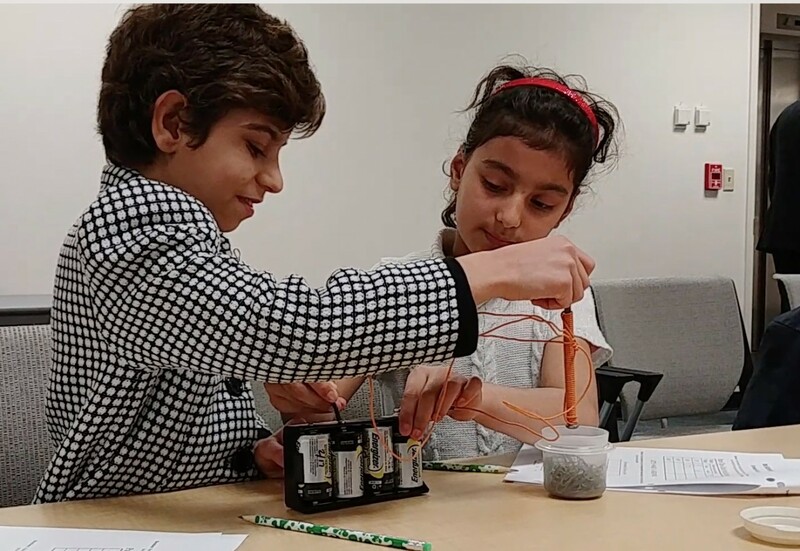 During the Magnets and Electromagnets experiment, students learn how to build an electromagnet and see firsthand what affects its strength, giving them an inside peek into a real-world technology the lab uses to complete its work. Participants also get front row seats to Frostbite Theater, the home of liquid nitrogen experiments. These experiments showcase different interactions to wow the small STEM learners. Becoming junior scientists doesn’t end after a visit to the lab comes to a close, though, as BEAMS supports classroom STEM curriculum with downloadable experiments the students can complete in class or at home, such as the Human Accelerator, and games, like the Energy Sources Crossword. They can also practice SOL test questions, with answers and explanations by accessing the lab’s Science Education website. The goal of on- and off-site activities, such as these is to make science, technology, engineering and math less intimidating. Another goal of the BEAMS program is to make a positive impact on the representation of women and minorities in STEM fields. African Americans, Hispanics, and females are all underrepresented in the STEM workforce, with students losing interest in these fields long before reaching college. “It’s important for these students to understand the career possibilities that are open to them even if they aren’t seeing them modeled directly in their day-to-day lives,” Surles-Law explains. The BEAMS program thrives due to the efforts of a veritable army of diverse staff members who volunteer to share their time, expertise and personal stories with BEAMS students. 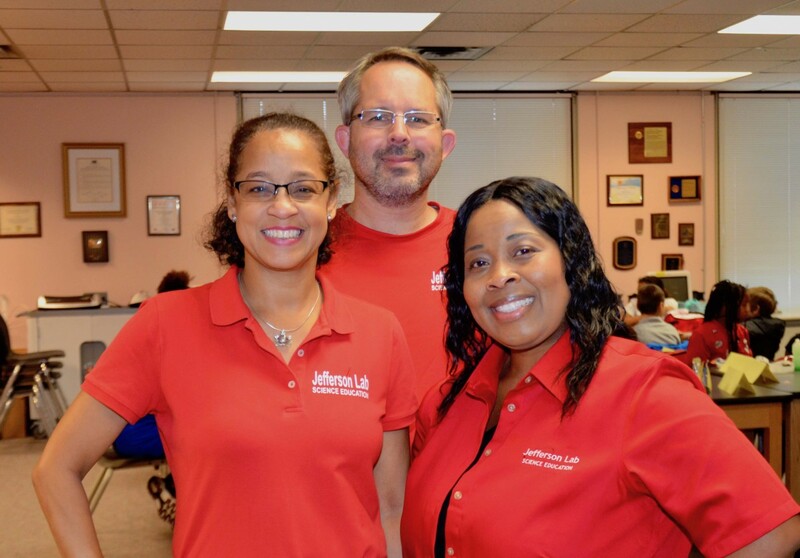 Through the BEAMS program, Jefferson Lab staff members motivate students to continue learning.